A perfect waste of time: LO "Together"
Hello there! Here is my new LO "Together". It is me and Ulrika in a photo. We were just playing and having fun with a new photo camera when this photo was taken. isimylejau sita LO... jis labai grazus, mielas ir idomus! This is just stunning! I love all the paper distressing that you did on it! BRAVO! denne kunne jeg tenkt meg å lifte hvis det er mulig? 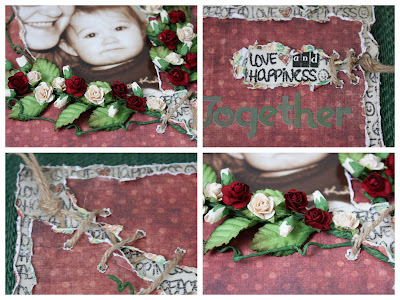 This is beautiful Loriete..I love the tearing and stitching of the whole page! !